My brain keeps nibbling at the fact that Jay is gone. I knew, we all knew, that this was coming. No one gets out alive and all that stuff, and Jay’s diagnosis meant that his time was coming like a lightly loaded freight train on a downhill track. But the brain still keeps kicking up thoughts and remarks and…well, all the stuff that comes up when you think of someone who’s been an important part of your life. Not closely personal. Jay and I never went there; for one thing I’m quite married, and for another, despite his hugely wonderful and welcoming self, we were two very different people in areas which were important to both of us. I’m outdoorsy, active, and I play with guns. Jay and I talked about that quite a bit, but those differences would have been a huge difference between us. Also, even though I’ve currently walked away from faith, I still have an underpinning belief in Something out there which Jay lacked. Nonetheless, we had a delightfully fun and scintillating ongoing conversation about life, writing, and politics. Actually, a discussion about faith was part of our first meeting. While I’m sure I encountered Jay in the con world before, it wasn’t until Potlatch 2007 that he and I sat down and became friends. I had decided to resume my off-again, on-again writing career and had at least one story burning through my fingers. The old Orycon concom crew was running Potlatch that year and brought me in as a minor volunteer. I’d heard of Jay before–a year or so earlier, I’d read Rocket Science in the capacity of an Endeavour Award first reader. We chatted, he politely propositioned me, I politely refused, and we continued to talk, late into the night. There was quite a cluster of us up in the top floor bar those two nights. From there, I ended up joining Fireside Writers in its heyday at the Fireside coffee place on Powell. Nearly every Tuesday, I joined Jay and a pack of other writing people to pound away on our stories. After a certain period of writing time had passed, we moved on to dinner, usually at the Barley Mill but sometimes other places. Lots of talking about writing, career planning, more writing, and other stuff. Jay frequently took possession of a large, comfortable recliner. He cranked out words to the degree that the chair was somehow viewed as magical, and when he wasn’t there, we vied for the choice of the Chair of Many Words. One day, while working on what became “In the Forests of the Night,” he started asking who wanted to be in a story. One of the other writers volunteered and he wrote her in. A few paragraphs later, he asked for a second volunteer, and I stepped up. So I got written in as Ward, in the opening pages. That’s what life was like writing around Jay. I learned how to write in a coffee shop by writing with him. Before then, I really wasn’t that great at writing in noisy, public settings. But by following his example, I got better at it and now, well. I grab moments in coffee shops, especially with my current work commute and all. Working at the same time, in the same place, with Jay was an education in and of itself in the nature of writing. There was focus–but we could also stop to discuss a challenge with the work. Above all else, we got infused with the spirit of the man’s psychotic persistence. Psychotic persistence was Jay’s own term for his writing success, and when you look back over his career, it rings not just in his writing but in his battle with cancer. 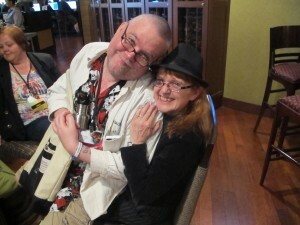 Cancer may have ravaged and attacked Jay, but by god, he turned around and battled it right back with the same spirit of psychotic persistence that propelled him to his stand in the speculative fiction writing world. It stands to reason, I guess, that he was felled by the sort of cancer that equaled him in psychotic persistence, something that was extremely aggressive and intractable. Even though most of us hoped that Jay would prevail, well, the big C won this one. But it was a no-holds-barred, all-out war. That doesn’t mean the man didn’t have fun and didn’t bring fun to the people around him. The pranks we pulled at Radcon during the Radcon Bob era, including the cycle of pranking between Jay and Bob, were epic. When I heard of Jay’s death on Sunday, I commented that the world is much smaller now. That is so very true. 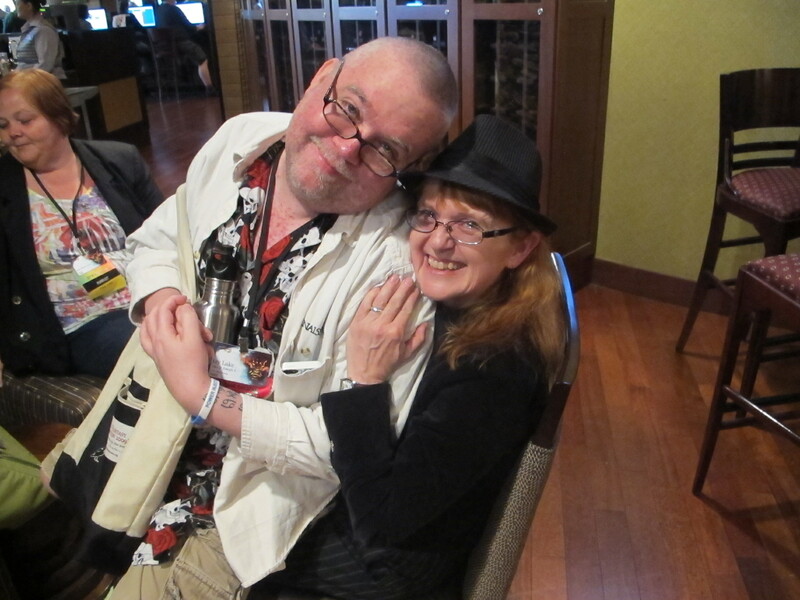 At the 2014 Norwescon, in the bar, we kept anticipating Jay’s arrival, even though we knew he wasn’t going to be there. I suspect that there will be many, many Orycons where we will keep thinking of and looking for Jay as well. Jay kept giving. One of his last public appearances was a speaking engagement to my reading intervention classes. I’d had the kids read and respond to one of his posts about kindness. So he came up and shared with the kids. It is always hard to tell about kids as to whether the impact someone makes is large or not, but I think it stuck. There is a Jay-sized hole in the world now. Eventually, those memories will ebb and the loss will feel less severe. But it is a loss, nonetheless. I am pissed at losing yet another friend to cancer, and I’m pissed that I won’t have more time to talk about writing, politics, and everything else with Jay. 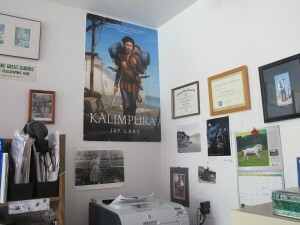 Before we moved due to the closure of the Fireside, Jay was working on both Kalimpura and wrapping up the Clockwork trilogy. He was beginning to talk about Sunspin and the challenges of going off of a contract to write it. At the last JayCon, some of the cover poster boards made up for the Clockwork and Green books were raffled off. Thanks to Bob, I won the boards for Endurance and Kalimpura. I gave Endurance to Bob but, despite Mike Moscoe’s attempt to persuade me to trade for Green, I hung onto Kalimpura. At first I thought it was just because I liked the subject, but now I realize I wanted that poster because…well…it represents something that was part of my early writing life and the role Jay played in this latest manifestation of my writing life. Goddamn it, Jay, I’m going to miss you. Shine on. You will be remembered. I didn’t put my “Farewell to a Friend” post up on this blog because, frankly, at the time, going through WordPress seemed too cumbersome and complicated and I just couldn’t deal. I can do LiveJournal in my sleep. Even though WP isn’t any more complicated, really, I just didn’t have the spoons. I have spoons now. Nonetheless, I’m still gobsmacked and in shock from the death of my friend Lori. It’s been just about a week since I got the two calls from her husband–one, to tell me how severe it was (news that I both expected and dreaded hearing, suspecting it did not make hearing it one whit better), the next to tell me that she was gone. It took DH and me nearly a week before we could talk to each other about it, and that only after we went to see her husband. In the interim, we went to Oregon Country Fair, which was probably the best thing for ourselves that we could have done. Even then, I found moments where I thought “I can’t share this with Lori any more.” Not “I’m going to share this with Lori–oh, no I can’t.” I wasn’t even thinking about sharing and then realizing. The realization that I couldn’t share was there. Stark. Huge. Like the cavity left after a freshly-pulled tooth, that your tongue keeps seeking out and exploring. I mean, who the hell else in my life now can I share that frisson with that I experienced when Bernadine Dorhn spoke up at the panel with herself and Bill Ayres to say “Let’s hear from a sister” and realize that for her, it wasn’t just posturing or pandering but a genuine expression of feminism that was deeply internalized and not conscious. A reflection of shared experiences and dialogue that wouldn’t need a lot of explanation. Someone who would resonate in such a way that I wouldn’t have to explain why it touched me in the way it did. Besides DH, one, maybe two people who are reading this (Kris Lewis and John Silvertooth, I’m LOOKING AT YOU). There is a whole history of verbal and ideological shortcuts with someone that just died. A library of thirty-two years of shared experiences and reflections that is no longer available. It’s not just Lori who died, it’s a part of me who died with her. A partner in ongoing dialogue. Our relationship was intellectual and ideological, not just personal. You don’t build such relationships overnight, you build them over a lifetime. And the personal was political. Working class rural left political. Part of our last conversations included discussions about what’s happening with the longshoremen in Longview and the degree to which there’s a lot of grass-roots longshoremen support in the town. Most folks who know me on line don’t know that much about my political past. It’s never been headliner stuff. With rare exceptions, I’ve tended to avoid cameras and media attention, just been the girl in the back room who kept stuff going, who did the research, who saw what happened. Lori was a big part of that past. One reason I’ve not talked about it is because she was intensely private and I respected that privacy. Another is that if you’ve not been in those back rooms on the low level campaigns, you don’t know what that life is like, and it takes too damn long to explain it before getting to the point. Most people really don’t want to hear about this. Plus there are some political insights that you can only share with your closest circle when you’ve been in that world. Skeletons that both of you know about that maybe are no longer relevant because of various reasons, and can grimly share the latest development without a lot of expository detailing. And to be honest, I know damn good and well that there are people out there who are both happy and relieved that she is gone (none of you who are reading this, for certain). You play in the small level political world and that’s the truth of things. There are always shadows when you play in the political world, and sometimes karma takes a very long time to come around. Some secrets go to the grave. Others are freed by the grave. All of this is a very long way around to say that there are shadows flitting around me now. I’m not sure where they will take me. But…I feel this loss very deeply. Lori was a part of my life for longer than my mother was and almost longer than my father (my mother died when I was twenty-nine, my father several years later). I wouldn’t say we were necessarily BFF in that blindly cheering way so many people like to proclaim…but we were close friends, good friends, and still…it’s a loss. Kris Rusch has an excellent post about life rolls, those moments in your life when one phone call can knock you in the gut and send you to your knees because something huge and bad has happened which puts the writing on hold and changes your life. I read it at the time, acknowledged it as truth (I’ve had some ongoing affects from work drama over the past few years), and didn’t think much about it. Then a few days later we started on a saga that was, effectively a life roll. For me, most of the life rolls I’ve encountered haven’t come from phone calls. Some have, such as my mother’s final cancer. The starkest life roll I had was when the husband had his ski accident and I was on the slope above him, looking down to see him clutching at his shoulder and rolling around in pain. Almost as stark but more drug out were the son’s first struggles with Crohn’s Disease when he was sixteen. We’ve lived a life of compromise with Crohn’s since then, a whirling circle of compromises with the Remicade treatment protocol and negotiations to make it work. We’d finally gotten to where he could do the typical Remicade administration, which changed it from a day-long slog to a quick few hour infusion. Well, so much for that. This life roll started with the son (now twenty-five) telling us he couldn’t keep any food down and had abdominal pain. Went to the ER the first time. Got meds, came home. The next evening DH had to take the son to the ER and he ended up being admitted. That hospitalization lasted several days, but we thought we had a handle on it. Uh, no. Five days after that discharge, DS started throwing up as I was getting ready to go to work. I got that same feeling I’d had on the ski slope watching the DH writhing in pain. I told him we were going to the ER, called work and told them I’d be there but I didn’t know when, called DH and begged for help, then went to the ER and waited until DH got there, then headed for work. That ushered in five days of work climaxing with an emergency surgery which turned out to be much more major than we’d thought it was, ending with a really rough hospital recovery that kept DS in the hospital for almost two weeks. He’s at home now, and recovering well, but, overall, it’s been a really rough four weeks for the three of us. Long-term impact is that not much writing work has gotten done in those four weeks. I’ve made some stabs at progress but the worry has shut a lot down. Meanwhile, work drama has continued apace, and it’s probably been a good thing that I’ve been detached from it. Still, it’s fed into things. The brain is starting to stir again. Nonetheless, it means I’m really behind the eight ball with regard to website updates, with writing, and with getting on with my life. I hope to be able to move on from here, though, and be back to writing work with a vengeance. Changes need to be happening and they will be soon. But still, yikes. So much to do.